Journey to the Sacred Valley of the Incas and experience the magic and wisdom of Peru. Are you longing for a transformative retreat that will help you get the answers you are looking for? Do you want to take a trip that will create a powerful shift in your whole self? You know that your best work happens when you are in deep alignment with your soul. You know that in order to grow, humans must learn to embrace challenges and move through our blocks rather than running away and hiding from them. You know and value the power of Mother Nature to provide insight, compassion, and space for healing, growth and transformation. You are someone who stops at nothing, who seeks challenges in order to expand your capacity and your awareness. You long to live more authentically and more freely, to speak your truth and live your truth in each of your words and actions. Step into your Power...and Peruvian hospitality. Have the strength, tenacity, and confidence to unearth blocks and overcome shadows that arise in the midst of our everyday lives. You will know how to align with your personal power and truth by using your individual yoga practice to create intention. Your own inner light will shine brighter because you will have released self-limiting beliefs and opened up space heal and grow. Surrounded by the majestic Andes mountains and sacred sites of ancient Peru, you will return home with fresh insight, personal clarity, and renewed vision for yourself. In Peruvian mysticism, Pachamama is the feminine spirit that lives in the Earth, she is Mother Earth. She is the guiding, energetic force that breathes life into everything that exists. Without Pachamama, nothing is alive. As Westerners, we can learn from this special relationship that the stewards of the Andes share with the planet. Life is seen as incomplete without recognizing, respecting, and honoring the Earth for all that she provides. Honor and respect are taught as an effortless act of pure receptivity: the ability to accept all of the gifts of life that are poured into our hands and to acknowledge from whence they came by caring for and protecting the needs of the planet. Pachamama is the source of everything that we are. Just as the Earth is a living, breathing, complex organism full of life and death, chaos and creation, we too, are biological, living breathing organisms with these capacities. By connecting with Pachamama, we connect with where we come from. When we are connected with our source, we tap into the limitless potential of our own intuition, our ability to know and trust our instincts, our values, and our individual truths, so that we can live authentically and freely. The Sacred Valley of the Incas, in the Peruvian Andes, is still alive with the culture and mysticism of the ancestors who first cultivated this knowing. These teachings are sacred not because they are secret or reserved for the few; they are considered sacred because they are essential to the wellbeing of all beings on the planet. The message to listen to our own hearts is a message to be shared amongst all. When you stand high atop a young mountain (yes, the Andes are actually a relatively young mountain range!) amongst the ruins of this ancient civilization, the message is still alive and meaningful. You feel it in every cell of your body. The wisdom of Peru is calling. Step into your Power…and Peruvian hospitality. Over 10 days and 9 nights, we will wind our way south through the Sacred Valley towards the magnificent Machu Picchu, exploring various archaeological sites along the way. Our first stop lands us in the heart of the valley where, at Yoga Mandala, time seems to completely go away. Within its spacious and vibrant gardens are a dozen rooms decorated with Peruvian handicrafts. The retreat center has modern conveniences, but no modern annoyances – and miracles seem normal. Here you’ll experience the finest of Peruvian hospitality – whether you want to sip coca tea, journal in the yoga room with perfect view of snow-capped mountains, or have a meaningful conversation while hiking to a local waterfall. The bluest sky you’ve ever seen will soothe your soul as you remember what it’s like to actually slow down and enjoy life. Within this perfect sanctuary to unplug, you’ll take a moment to catch a few rays of sun in the gardens – or wander the valley and explore the surrounding nature. After 5 days of the finest local hospitality, we take the train south to Aguas Calientes, where we will prepare for the journey to magical Machu Picchu. 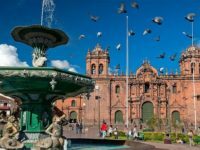 Our final days in Peru will be spent in the ancient city of Cusco, where you will see how ancient culture is still alive within a modern city of music, dancing, arts, and cuisine. Each step of our journey has been thoughtfully planned and carefully designed to offer you a unique and intimate experience in Peru like none other. Travel in a third-world country can be confusing: planning an itinerary, finding local guides, figuring out transportation, and finding time to relax and enjoy delicious food, are difficult enough tasks in your home country. You will be guided, cared for, and supported step by step as we traverse mountains, yoga, and mysticism with the utmost care and attention. This is holistic experience: in keeping with yogic philosophy, we will embody the stages of yogic practice during each part of itinerary. It is our intention to support you to Ground, Reflect, Explore, Elevate and Expand your whole self during the retreat ir order to have an unforgettable experience. Our first 5 nights’ stay in Peru will be at the impeccable Yoga Mandala where you will wake up each morning to majestic mountain views, watching the sun rise high enough in the sky to pass above the distant peaks. Here you will be immersed in Nature; the beautiful bio-construction retreat center was designed to have the least possible impact on the surroundings ecosystem and is virtually non-polluting. Its gardens are bursting with native flowers and herbs; mountain springwater flows through the property creating a soothing musical background. The chakra inspired double bedrooms with private bathrooms will provide you with harmonization and inner discovery. At Yoga Mandala you will experience the native cultures’ (Quechua speaking) outstanding hospitality. Their offerings of love and simplicity create a peaceful environment, providing you with personal privacy and solitude ideal for your own spiritual growth. The property also boasts a stunning yoga space, ceremonial spaces for sound healing, temescal ceremony, and a shop with curated goods by local craftspeople. You will have the opportunity to receive private shamanic healings, Reiki, or massage if you so choose. Yoga Mandala will be your Peruvian home away from home. As we climb our way south towards Machu Picchu, we will spend the evening in Aguas Calientes, a bustling city built to house the nearly 2500 daily visitors to Machu Picchu. Full of kitschy souvenirs, winding and hilly streets, this will be our stopover to get a good night’s rest so we can visit Machu Picchu at dawn. Our hotel is located centrally, so that it is easy to navigate the town. During our stay in Aguas Calientes we will receive a Shamanic Sound Healing with our local native, to help calm our bodies from travel and prepare our hearts for Machu Picchu. 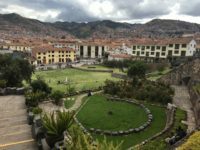 After a week of sight-seeing and travel in the Peruvian countryside, we spend the final days of our trip in the bustling ancient/modern city of Cusco. Here you will wake up to an epic view of the surrounding Andes mountains from your cozy hotel room in San Blas, the arts district of the city. While in Cusco you will enjoy the spectacular cuisine that Peru is known for, including the award winning restaurant Chi Cha. We will stay in a family owned Hotel, located centrally in old Cusco, where you can walk (or climb rather) the narrow stone-paved streets and explore the plethora of artisan shops, restaurants and bakeries. Your journey begins when we meet as a group in the ancient city of Cusco and tour the Temple of the Sun. We will travel by private bus from Cusco to the Sacred Valley with a private guide and private driver. Our driver will transport us for day trips to and from our yoga sanctuary. Throughout our trip, our tour operator will be with us to help answer your questions and to offer translation, when necessary. 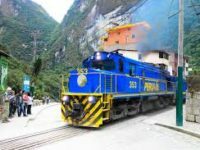 From the Sacred Valley to Aguas Calientes we will travel by the renowned Peru Rail, a train ride with spectacular views of the surrounding mountains through the glass ceiling of the train cars. Finally, we will journey back to Cusco via Peru Rail, where we will meet up with our private driver and bus to conclude our trip. Please note that cabs to and from the airport are not provided as part of the trip package. All other necessary internal travel is inclusive. Peru is quickly becoming one of the best food destinations in the world. Known for its hundreds of varieties of potatoes, quinoa, fresh vegetables, simple spices, fresh cheese, avocados, and delicate herbs, each meal will be sure to delight your senses and satisfy your soul. The incredible staff at Yoga Mandala will be feeding us homemade, Peruvian style vegetarian meals during our 5 day stay in the Sacred Valley. As we explore the city of Aguas Calientes/Machu Picchu, our meals will be at local restaurants, and we will be given a packed lunch for Machu Picchu. In Cusco, we will have the opportunity to dine in some of the city’s most beloved restaurants, and you will be able to explore sweets and other local fare in the city’s many markets and cafes. All provided meals will be (optionally) gluten-free, vegetarian, vegan friendly. Hospitality, Experience, Awareness, Kindness. These are the values we embrace and with which we plan our retreats. Taking care of every detail so that you do not have to worry about the itinerary, where you’re going to be sleeping, or what you’re going to be eating, is what we do best. That is why we work with an amazing team: from our Tour Operator Unai who does all the behind the scenes planning and ensures that everyone runs smoothly, to local shamans whom we have had long-time personal relationships with, sharing their homes and breaking bread together, to ensure you receive an authentic experience. Our team takes on those tasks with years of experience, skill, and expertise, so that we are there for you to support your journey, answer questions, and share in your experience. ”From the get go, Rian and Hannah were very well organized and guided us through all our preparations, whether it was recommended flights, trip logistics, adapting to changing weather conditions or just answering many of our queries. Once we were in Peru, every detail of our trip was meticulously planned - our accommodations, the scenic train ride to Machu Picchu, the amazing ancient local ceremonies and visits to places of history and interest. You are ready to let go of self limiting beliefs and become the most authentic version of you? You want your yoga practice to support the evolution of your human spirit far beyond downward facing dog. This is not just a vacation to Peru with some yoga classes thrown in. On this journey, your yoga practice will grow as you immerse in an environment that is both nurturing and challenging. Together, Hannah and Rian provide a full spectrum of yogic knowledge and understanding, to support you creating a yoga practice that will serve your human evolution. Hatha yoga and Kundalini yoga will serve as the foundation for helping you to center yourself, look within, and go deep. With their intelligent and pragmatic instruction, you will find your own strength and clarity, and learn the tools to access your own intuition to harness your own power. Hannah is known for her articulate and precise alignment instruction that will help you pinpoint exactly what your body needs in order to transform. With a background in mythology, Ayurveda, and clairvoyant healing, she offers a intelligent, creative and compassionate approach that teaches you how to listen to and be kind to yourself with freedom and ease. Rian’s teaching creates the space for tangible, visceral, blissful, grounding, and unexpected opening. Through the practice of Kundalini Yoga, you will work deeply to release subconscious blocks, embody the strength you possess to relate to your compassion and majesty. You will lead yourself through an Ayahuasca journey using the medicine of yoga instead of the medicine of the ancient Andean vine. 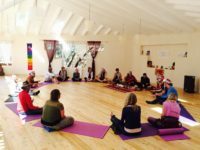 Our yoga program is specifically designed to help guide you on your own personal journey of centering yourself, connecting to your authentic truth, accessing your own wisdom, harnessing your innate strength, and learning to go beyond the chaos and challenges of life while staying in alignment with yourself. Connecting with sacred sites located amongst archaeological ruins creates a tangible relationship to the history, mythology, and spirituality of the shamanic tradition. We visit specific places that teach about the symbolic totems that anchor the shamanic tradition as forms of insight and inspiration for your own personal understanding. Our journey begins the most important temple in the Inca Empire, Coricancha, or the Sun Temple, located in the ancient city of Cusco. The walls were once covered in sheets of gold, and its adjacent courtyard was filled with golden statues. Spanish reports tell of its opulence that was “fabulous beyond belief”. Transformed by the Spanish into a Church, walk amongst the remains of the ancient temple to experience the haunting memory of the Incan empire. 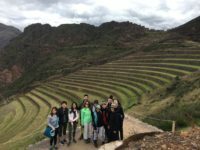 A city built into the mountainside, Pisac offers stunning views, and an incredible hike through the ruins of a city in which thousands once lived. The Incan civilization, while not modern, built genius structures that allowed them to inhabit mountaintops all throughout the Andes. The modern-day city of Pisac is world famous, perhaps because its market stalls spread from the main plaza into inclined streets – leading all the way to the foot of the mountain. 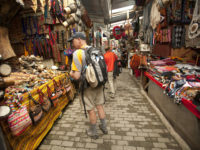 You’ll spend an afternoon wandering through hundreds of individual vendors, sifting through to find a unique, hand-made trinket or gift, dazed by the many colors from the vegetable stalls, and satisfied by a homemade Peruvian meal. Throughout our journey, we will be introduced to the Incan archetypes of the Puma, the Condor and the Serpent. Central to the understanding of the ancient’s spirituality, these mythic symbols offer a playful and sweet understanding of how we can look at our own lives to transform. Located in rural highlands, Una Urco or the Water Temple is a rare and unique place to visit. Dedicated to the serpent, a symbol of the subconscious mind and representative of the underworld, this temple possibly represents the purification of shedding skin, being reborn and transformed. Filled with artifacts and realistic representations of Incan life, this museum is a beautiful and fact-filled way to learn about how the Incans lived. The purpose of ritual is to provide a space for reflection, healing, release, renewal, and celebration. The ability to move through these phases is said to create warriors: individuals who do not run away in the face of challenges, but those who are capable of summoning their own strength and moving towards their own highest potential. Different native traditions utilize different methods to approach ritual; and some traditions utilize the use of plants as medicine to inform the journey and the healing. All of our ceremonies will take place in the present time, without the use of specific plant medicines, in order to give you tools that you can take with you and use in your everyday life for continued growth, healing, and expansion. Temazcal is a sweat lodge that originated from pre-Hispanic Indigenous peoples in Mesoamerica. Shamans in the Andes have adapted this ceremony to help cleanse and renew the mind, body and spirit. Participate in this ritual to let go of anything you no longer need to hold on to, heal old wounds, and become your warrior self. Travel into a tranquil and deep meditation, led by the haunting and familiar sounds created by an orchestra of natural instruments: Himalayan and crystal singing bowls, Chinese wind gongs, Japanese temple gongs, bells, whistles, flutes, drums, rattles, shakers, as well as several rare and traditional shamanic healing instruments such as bird quill pan pipes, Peruvian Chimu water whistles, and reproductions of 3,000 year old Peruvian flutes. Our sound Shaman Hebert Jordan Lira’s ceremony offers a healing gift to your entire body, mind and spirit that leaves you feeling relaxed, renewed and connected to the great mother earth, Pachamama. A cacao ceremony is an opportunity to connect to yourself and open your heart, both key to expanding your sense of self. Whether you are looking to deepen your understanding of who you are, release old patterns and traumas, or move into a more self-confident space, the cacao allows you to the insight and awareness to move towards that goal. 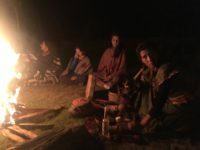 Amidst the backdrop of the Andes mountains, beneath the moon and stars, we will use fire, intention setting, consumption of this delicious medicinal drink, as well as music to facilitate a great opening of your heart and feeling of self-love. Despacho offerings are retributions and prayers to the Mother Earth (Pachamama) and the Apus (spirit of the mountains) for all of the blessings received. Within this work there are rituals which have developed for prosperity, safe travels, good health, prosperous work, overcoming obstacles that impede one’s development both in the material and spiritual realm. Format: Participants sit in a half circle around the despacho, Humberto makes the mandala offering, participants come up one by one to place their prayers and the coca leaves provided in the despacho, Humberto blesses each person’s prayers and leaves. The group then prays together over the bundle with bells, breath and words for its fruition before it is burned. We know how precious your time is, and our Itinerary has been carefully designed to bring you the most from your trip while providing you with an authentic connection to the culture of Peru. Our team includes local guides who grew up playing amongst ruins and listening to the stories, secrets, and wisdom of their ancestors, and who have devoted their lives to learning and sharing the history and culture of their homeland. In the rural Andes, life is lived a bit differently; and we strive to provide you with modern comforts while respecting the stewardship of the land that the locals strive to maintain. Our itinerary is built carefully and intentionally yet flexibly so as to account for the hidden surprises that one may encounter while travelling abroad. 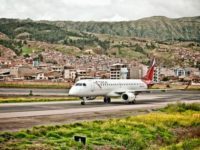 Your round-trip airfare to/from home to Cusco, Peru on June 21 and June 30, 2019. Each member of our team, each moment of the day, has been thoughtfully chosen so that you can be guided on this journey. Space for this retreat is limited and available on a first-come, first-served basis. Sign up now to confirm your space! Because Machu Picchu is one of the most popular places to visit in Peru, and its ecosystem is fragile, entrance tickets are limited and must be purchased at least 6 months in advance to ensure availability. Payment will be due in full by February 28th, 2019. Your deposit guarantees your retreat reservation. Deposits are non-refundable. *Please Note that all rooms are Double Occupancy. Because of the nature of travel with a group in small towns in rural Peru, we can only offer double occupancy. If you book alone, we will place you with a roommate of the same gender. PAYMENT PLAN: Make a $500 Deposit at registration. Your First Payment is due 15 days after registration/deposit is received. Your Second Payment is due 30 days after 1st payment. If you sign up after February 1st, your full payment is due by February 28th. PAY IN FULL: You will be billed one easy installment. Questions? Or need to talk to us about a payment plan? Please send us an email. You will receive an email prompting you to submit your Payment*. You will then receive a confirmation email and be prompted to schedule your 1:1 Clarity Call with Hannah & Rian. *Payments can ONLY be submitted via check, Venmo, or Bank Transfer. We do not accept online payments. After you complete your online registration, you will receive an invoice to complete your payment. Make no mistake, this retreat is for real people who want to do deep sh*t. All joking aside, if your desire is to heal, open and expand your vision of yourself and your capacity as a human being, then this retreat is for you. –CULTURE All of us come from different economic and cultural backgrounds, and have varying expectations when it comes to travel. Please keep in mind that Peru is a third-world country, and while modern conveniences are more widely available in larger cities, we will be spending most of our time in rural areas where resources and cultural practices are just….different. An open mind is key to enjoying yourself and feeling cared for. That said, don’t worry, all modern conveniences (like plumbing) will be up to standard! 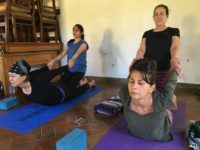 –YOGA There are no yoga prerequisites for this retreat. Students of all levels of experience and background are welcome. Whether you are brand new to Kundalini yoga, or you have been practicing meditation only for 20 years, Hannah and Rian have the compassion, experience, and skills to hold space for students of varying needs, abilities, and knowledge. –ALTITUDE Cusco, the Sacred Valley, and Machu Picchu are all located between 8,000-11,000 feet above sea level. Altitude affects everybody differently, and there is no way to predict how the altitude will affect your body. People of different ages, athletic ability, and health all have different experiences with altitude. The locals offer Coca tea to combat the effects of altitude sickness. We recommend avoiding alcohol and limiting caffeine consumption and consuming a clean diet in advance of the trip, so that your body is hydrated and healthy when you arrive. We have found that arriving exhausted does seem to exacerbate altitude sickness. Please consult your physician for advice if you have any concerns about your health. –WEATHER That said, we will be in the mountains! And, while it’s summer in June for those of us from the Northern hemisphere, in June Peru celebrates its Winter Solstice. Don’t fret! During the day, the temperatures can climb into the upper 70s (Hannah was sunbathing in a swimsuit last year!). However, please note that it is essential to pack for cold weather, as temperatures in the early morning and at night can go down into the 40s. We suggest lots of layers, warm socks, scarves and hats. And there is certainly no shortage of beautiful handmade alpaca clothing and accessories to purchase. –HIKING Because we are going to be in mountains, at many times we will be hiking. The rigor of the hike is determined by you: there will always be an alternative available for those times when your body tells you it needs a break. 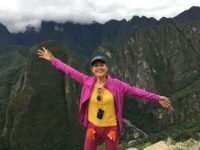 Please note that this is not a hiking trip to Peru, and while there will be many opportunities to explore Nature, it is not the main focus of our trip. –hiking cont’d We will NOT be hiking the Inca Trail to Machu Picchu or Inti Punku (Golden Gate). We WILL be purchasing tickets for you to hike Wayna Picchu, the mountain that sits across from Machu Picchu and offers spectacular views of the ancient city. It is a steep and narrow path, and the hike is optional. –FOOD/WATER The retreat is completely inclusive of food so as to ensure you are only eating foods that have been properly washed and prepared. Foodborn bacteria in any region outside your home is likely to have bacteria that are unfamiliar to your gut environment, and so any time you travel you are susceptible to contracting illness. All of the water at Yoga Mandala is filtered water; and bottled water is cheap and available to purchase everywhere throughout our stay. Personally, we always begin taking probiotics several weeks in advance of travel, and para-cleanse herbs post-travel, to support and maintain healthy digestion before, during, and after the trip. -ANIMALS Throughout our trip you will encounter many goats, dogs, llamas and alpacas–all of which you may feel tempted to pet and touch. PLEASE NOTE that touching animals puts you at risk of contracting viruses or bacteria and pet at your own discretion. –VACCINATIONS Please visit the CDC to determine whether or not to get vaccinations. Be aware that many vaccines need to be initiated several months in advance of travel in order to be effective. –Shamanic journeying offers an opportunity to immerse in the mysticism that is still alive throughout the Andes region and beyond. We believe it is an important aspect of this retreat to help you to encounter, heal and move past your blocks and challenges. NONE of the rituals include plant medicine that induce hallucinations; however, all of the rituals will lead you on the path from shadow to light that is ubiquitous in shamanic work. Please be aware that a temezcal ceremony is a sweat lodge, carried out in a dome shaped room that is dark. All ceremony is optional; if you have a medical condition that prevents you from participation you will still receive the benefit of this work. Listed Room Prices are based on DOUBLE OCCUPANCY. If you would like us to try and pair you with a roommate, you may reach and and we will do our best to find someone for you to share with. Any cancellation will result in a total loss of the $500 USD deposit.Cancellations made between November 15 and December 31, 2018 will result in a loss of 50% of the trip price. Any cancellation made between February 28 2019 and the trip departure will result in a total loss of funds. We reserve the right to cancel the trip if it is not meeting the trip minimum (if we do so your deposit is refunded in full). We reserve the right to determine if you are not a good fit for this trip (if we do so your deposit will be refunded in full). Should the exchange rate vary more than 5%, price is subject to change. Trip cancellation insurance is always recommended whenever making travel plans. You can use our suggested Travel Guard Insurance online and choose from several policy options. Our tour operator Unai and the wonderful staff at Yoga Mandala will do everything to make your stay relaxing and comfortable. Trip cancellation insurance is always recommended whenever making travel plans. You can use our suggested Travel Guard Insurance online and choose from several policy options. There are no planned activities that require elite/athletic physical performance. There will be options for hikes to accommodate all participants. Hannah and Rian are seasoned teachers, skilled at holding space for classes full of students of all levels, from absolute beginners, to folks with injuries, to advanced practitioners.